The Cumberland & Dumfriesshire Farmers Mart P.L.C. 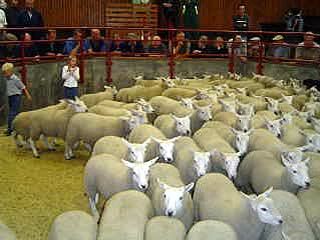 had forward 1,520 store lambs and 301 breeding sheep at their weekly sale at Longtown on Tuesday 3rd August 2010. Store lambs were in great demand (up £6.88 on the year). Top price of £63.20 for Texels from Underburnmouth, £58.50 Haswellsykes; Charollais £57.50 Haswellsykes; Suffolk £55.80 Glendhu, £53.80 Haswellsykes, £53.50 Bateyshield; Greyface £54 Knarr, £52.50 Lowes, £50 Sanders Close; Blackface £37 Lowes. Breeding ewes met a keen enquiry and short of requirements. Top of £108 for correct Suffolks from Linton House; Texel £100 Greenknowe; Beltex £77 Greenknowe; Lleyn £82, £80 Mark Farm; Greyface £66 Mark Farm.